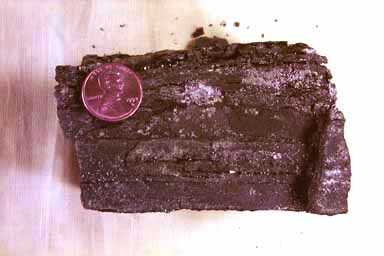 Black, well jointed, often layered, sometimes conchoidal fracture, smudges off on fingers. Bituminous coal (all coal) forms from the destructive distillation of plant remains under anaerobic conditions. It results from burial and compression, and the driving off of hydrogen and other volatiles leaving behind fixed carbon, with varying amounts of sulfur, and other elements. If it is buried and heated enough it will turn into anthracite coal, and finally graphite.